So, what is a commis chef? The commis chef is a basic chef in kitchens who works under a chef de partie. They will learn a specific station’s/ranges or sections responsibilities and operation. They may have recently completed formal culinary training or still undergoing training. What Exactly Is A Commis Chef? Commis chef – Will be learning a specific section of the kitchen working under a chef de partie. Also, they will be doing basic jobs whilst learning how the section operates. First commis chef – Will be the most experienced commis within the kitchen brigade. Furthermore, they will have an understanding of the sections and will oversee the rest of the commis chefs within the brigade. What Is A Commis Chef? The Commis Chef will be employed by an establishment that uses a commercial-grade kitchen, which will include a restaurant, hotel, or cruise ship. What Are The Key Qualities Of A Commis Chef? Key qualities that a commis chef will need to possess include the ability to learn on your feet. In addition, they should have a passion for cooking as the pressure in a kitchen can be hard work. They will also need to be versatile in the kitchen as there is a lot to learn in each different section of the kitchen. And it is important to have experience in all areas including – larder, fish, pastry, butchery, sauce. Before the commis goes onto specialising on a specific section. You will need to have a lot of stamina as you will be standing all day and there will be a lot of banter with the other chefs. It is possible to achieve this position with no qualifications. A commis could for example train on the job with an apprenticeship. Maybe even join an establishment with training programmes and start your career as a kitchen porter. A Job Description, The Responsibilities And Duties. The most common of establishments where this position is employed will be a restaurant and hotels followed by cruise ships. The culinary position of commis chef comes with a lot of responsibilities and duties. These will be the basic jobs within the kitchen and they will report to the chef de partie of the section. Commis chefs who are successful in this position will quickly learn an in-depth familiarity with sections operations. They can then fill in for the chef de partie when needed. And also assist them in resolving any problems that may occur in the section. Commis chefs will be responsible for the basic prep work for the section. They need to keep the section organised and tidy and follow the health and hygiene regulations. They will also be responsible for any other duties laid out within the commis chef job description following the company’s policies. Most of all the commis chef will have the responsibility for the food preparation that they have been directed to do. They will be directed by the chef de partie in charge of the section. They will also need to be aware of any problems that may occur in the section. The issues will need reporting to the chef de partie in charge. Commis chefs will also have a responsibility to follow any other orders from senior members of the kitchen brigade. What Do They Do In The Kitchen? The commis will be assisting the chef de partie of the section. First commis chef This is a position mainly in large establishments overseeing the commis chefs. Furthermore, the first commis will be well on their way to a promotion to a chef de partie. A commis chef is the lowest level chef job within an establishment and the salary reflects this. Even after finishing culinary training the commis will be starting on the basic salary. What is a commis chef salary? Kitchen position salaries depend greatly on the establishment, the location and the previous experience of the commis chef. Where Can A Commis Go From Here? Every chef will have started at the commis chef level. As a result, there is no reason not to have a vision for your career going all the way to the top. What are the progression options? the natural progression from this position is to a demi-chef de Partie, chef de partie ( the chef in charge of a section). And from there onto the sous chef role and head chef position. And in some kitchens, progression will be faster than in other kitchens. It is reasonable to stay in this position for 3-5 years to do all the groundwork needed for a successful career. I became a commis chef in 1997 having spent one year washing up as a kitchen porter. I started this position in a very busy restaurant in Cambridge with a bistro style menu. One of my first jobs included washing and preparing salads. lollo blonco , frisee, oakleaf, baby gem and cos lettuce for the caesar salads. I also had the job of opening oysters! Having never seen an oyster at this point let alone opening one of the things. This was a learning curve and I’m amazed I never cut myself badly doing so. Overall as a commis chef, I learnt a lot of the basic skills. Working in a busy kitchen also helped me to develop my organisational skills. The top 10 commis chef jobs? Firstly, the kitchen brigade is made up of a hierarchy of chefs. And the traditional most commonly used system is the one shown below. However, the number of chefs in each position will depend on the size of the kitchen brigade and how the head chef operates their kitchen. In addition, if you make a mistake, just keep going and try again until you get the job right. Even the best chefs out there have made kitchen fails at some point. The ‘boss’ of the kitchen. The Head Chef will have control over the running of the kitchen. This may include, ordering stock, employing staff, sacking staff, writing menus. The sous chef is the right-hand person of the Head Chef. The Sous Chef has many of the same jobs as the Head Chef. The Chef de Partie’s will be doing the day to day running of sections within a kitchen. In addition, this may include: preparing, cooking food, supervising junior chefs and making order lists on the section. The Commis Chef will be doing the basic jobs within a professional kitchen. First of all Commis chefs will be peeling potatoes and there are many varieties that may be used. Common potato types used by chefs include ‘maris Piper’, King Edward and sweet potato. 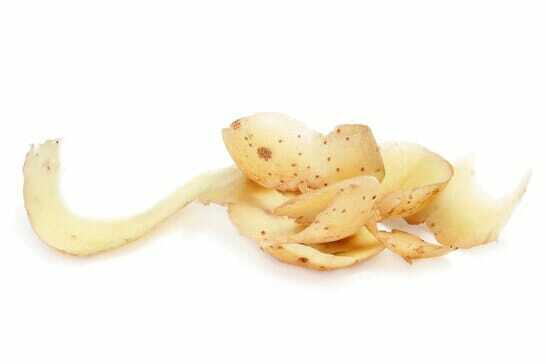 Tip – Use a speed peeler to peel potatoes efficiently. There are a variety of onion types that will be used. Varieties include Spanish onions, red onions and shallots. Onions are the main ingredient and preparing them is one of the big jobs of a commis chef. Spinach can come in packets, such as baby spinach. The spinach will still need washing, even if arriving in packets. With spinach, make sure the stem is picked out. Tip – Do not over salt spinach when cooking. A commis chef will be picking and washing salad. There are many types of salads including – frisee – baby gem – Lolo Rosso – lollo blanco and oakleaf. Tip – Always pay close attention to picking out all of the bad salad leaves. Fridges need to be kept clean and organised at all times. Tip – Clean around the seals inside the fridges well. Stocks will be made by chefs and one of the commis chef jobs may be passing the stocks through a fine chinois or muslin cloth. And this will remove all of the unwanted bits in the stock. Tip – When passing through a fine chinois, use a ladle to tap the top of the chinois. There are many types of vegetables that will need peeling. This will include standard vegetables and baby vegetables such as baby carrots. Tip – Use a good quality speed peeler for efficient peeling. There are many types of vegetables that will need to be prepared by the commis chef. Also, there is a broad range of techniques the commis chef will need to learn to prepare vegetables. And a full range of knife skills will need to be developed. Furthermore, you will need to learn the different preparation methods for a range of vegetables. Tip – Always have a sharp knife and learn how to sharpen it. Furthermore, remember to be patient when learning knife skills as it will take lots of practice to gain these skills. A commis chef will need to learn the correct cooking times for vegetables and how to check when they are cooked. Also, a deep fat fryer may be used for foods such as chips or battered fish that the commis may be responsible for. Tip – When blanching vegetables use a good amount of salt in the blanching water to help bring the flavour out of the vegetable. Chefs will be using many types of herbs. Also, these herbs will include parsley, chive, basil, and coriander. 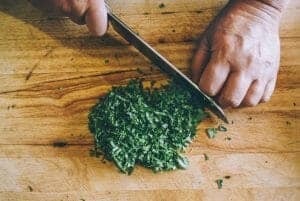 Tip – When cutting herbs its best to cut them once and do not over chop the herbs. In conclusion, these are my top 10 kitchen jobs of a commis chef. Also, there are many kitchen jobs a commis chef will need to learn and practice. Good practice of all of these commis chef jobs will give a good standard of basic skills. The uniform that a commis chef wears is known as the chef whites. To follow is a guide to getting to know the chef uniform. Chef wear or chef whites are the traditional names for the uniform. But nowadays the uniform can be altered to fit in with the branding of the individual companies. However, the traditional name has never changed. Non-Stick safety shoes need to be worn and ideally with a steel toe cap due to safety when lifting heavy objects. The chef uniform remains a standard in the food industry and the tradition of wearing the uniform dates back to the mid-19th century. Why Do Chefs Wear Chef Whites, The Traditional Uniform Worn By The Kitchen Brigade? Consequently nowadays with advances in materials the chef wear is a lot more comfortable for the chef’s, and with safety in mind. Sticking to the strict Health And Safety regulations. The kitchen brigade wears a traditional uniform called the chef whites/uniform. Chef wear includes a traditional hat called a toque, white double-breasted jacket and checkered / cargo pants. Chef whites have developed and nowadays are designed for the comfort of chefs. The trousers are checked or black and made of a light comfort fitting material. And the dark colours will conceal minor stains which signify cleanliness. Because the jacket is double-breasted it can be reversed due to the ability to hide stains. The light material helps to keep the chefs comfortable when working next to the heat of the stove and oven. And also protects from the boiling liquids. Also, the jackets use stud buttons so they can be removed before the frequent washing that the uniform will go through. The chef’s hat (torque) is available in different heights which may indicate rank within the kitchen. Chef hats were already in use, but he designed a uniform to honour the chef. To symbolise cleanliness he chose the colour white. Georges Auguste Escoffier brought the traditional chef coat to London when he managed the Savoy hotel and afterwards the Carlton Hotel. Aprons will be changed quickly when needed. Aprons come in many different styles, the striped bib apron or white apron will be used. Customised designs are also great to fit with companies branding. It is very important to choose a comfortable pair of shoes to wear in the kitchen. As the chefs are on their feet for the whole day and a great pair of shoes will help with the comfort of the chef. Non-slip soles are essential due to the hazards within a busy kitchen environment. And also a padded inner sole for the shoe for best comfort. The chefs uniform also known as the chef whites is a traditional uniform, with the more modern style dating back to the 19th century. However, chef whites have improved a long way since the 19th century. The chef’s safety and comfort are essential for the health and safety of the kitchen brigade. Up to date regulations and laws have improved this no end and will keep on doing so. The uniform now uses more comfortable materials that are easily washable. A great set of chef whites is crucial for anyone becoming a chef today with a great comfortable pair of shoes.